Doctoral research by an on-site intern will shape the way data are analyzed for experimental programs at the Nevada National Security Site (NNSS). Following three summers as an intern, Jesse Adams will join the NNSS as a post-doctoral researcher this May. 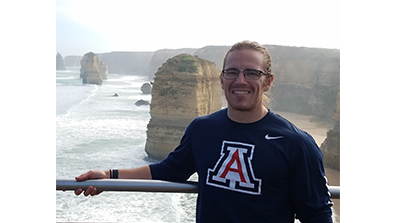 A soon-to-be graduate from the applied mathematics program at the University of Arizona, Jesse is also the recipient of the school’s 2019 Al Scott Prize Lecture. The accolade is presented to a student nearing the completion of his or her capstone research and includes the opportunity to present at the university as well as funding for educational materials. On April 12 at the University of Arizona, Adams shared his research regarding the development of the Site’s statistical methods for image processing. His work encompassed creating new computer methods for deconvolving very large images from X-ray systems. Through an approach called Markov Chain Monte Carlo, Jesse built schemes that supply information about uncertain quantities measured in data. In turn, this helps the team compare what Jesse’s computed to numerical simulations. Adams was first introduced to the NNSS during his master’s program at the University of Montana, where he met Dr. Howard. As Adams joins the NNSS full time, more than 60 incoming students are preparing for internships this May. Student Programs includes opportunities for post-doctorate, graduate, post-baccalaureate and undergraduate students at NNSS locations across the country. The success has been such that Dr. Howard’s team will continue its research relationship with the University of Arizona by bringing another student from its graduate program to the NNSS this summer for doctorate research. For more information about NNSS Student Programs, visit https://www.nnss.gov/pages/NFO/MSTSStudentPrograms.html.